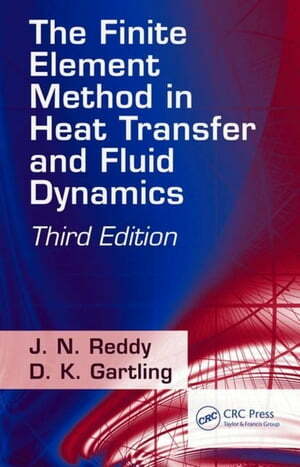 Collins Booksellers - The Finite Element Method in Heat Transfer and Fluid Dynamics, Third Edition by Reddy, J. N., 9781439882573. Buy this book online. As Computational Fluid Dynamics (CFD) and Computational Heat Transfer (CHT) evolve and become increasingly important in standard engineering design and analysis practice, users require a solid understanding of mechanics and numerical methods to make optimal use of available software. The Finite Element Method in Heat Transfer and Fluid Dynamics, Third Edition illustrates what a user must know to ensure the optimal application of computational procedures-particularly the Finite Element Method (FEM)-to important problems associated with heat conduction, incompressible viscous flows, and convection heat transfer. This book follows the tradition of the bestselling previous editions, noted for their concise explanation and powerful presentation of useful methodology tailored for use in simulating CFD and CHT. The authors update research developments while retaining the previous editions' key material and popular style in regard to text organization, equation numbering, references, and symbols.